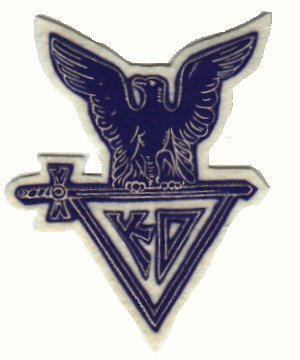 Knights of Dunamis - Founded in San Francisco, California on April 19, 1925 by Scout Executive Raymond O. Hanson. It was an organization for Eagle Scouts that was devoted to service. Ten Eagle Scouts formed the original chapter during the organizational meeting that night. The word "Dunamis" (pronounced Doo'-na-mis) is derived from the Greek word meaning power. "Knights" came from the tradition of chivalrous service begun in medieval times as in Knights of the Round Table. The official emblem consisted of an Eagle, sword and shield. The Eagle symbolized service, the sword represented the power of leadership through service and the three sided shield signified the three parts of the Scout Oath; Duty to God & Country, Duty to Others and Duty to Self. The neckerchiefs were white for general membership and royal blue for national officers (starting in 1949) with the emblem centered on the back. Members also had special hats. A Knights of Dunamis felt hat from Chapter 6 which was located in the Mt Lassen Council in California. is illustrated below. There was a special award within the group called the "Knight Eagle Award" that was created in 1927. It was the society emblem and had added a special wreath of eagle feathers around it. Less than two hundred were awarded after it was created. There were five qualifications to receive the award. The badge shown below was a conference delegate badge from 1929.